Theresa finds joy and beauty in gardening. She feels closer to the Lord God when digging her hands into His earth. "Not to be confused with cactus; botanically cacti are succulents but not all succulents are cacti. Succulent plants, such as this Aloe, store water in their fleshy leaves." "In botany, succulent plants, also known as succulents or sometimes fat plants, are plants having some parts that are more than normally thickened and fleshy, usually to retain water in arid climates or soil conditions. 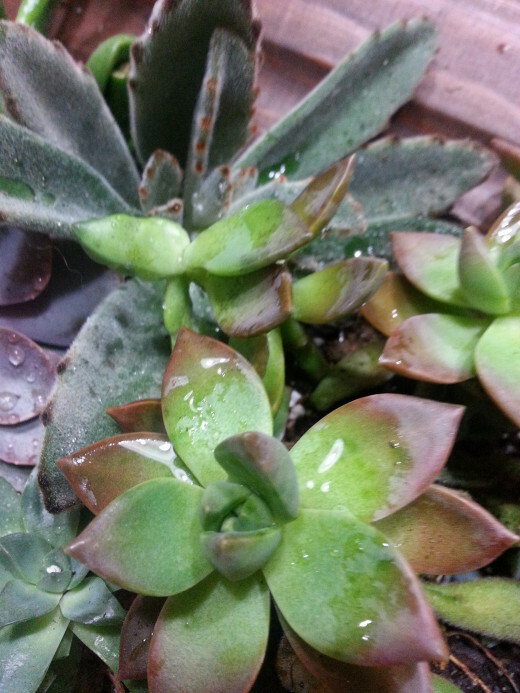 Succulent plants may store water in various structures, such as leaves and stems. Some definitions also include roots, so that geophytes that survive unfavourable periods by dying back to underground storage organs may be regarded as succulents. In horticultural use, the term "succulent" is often used in a way which excludes plants that botanists would regard as succulents, such as cacti. 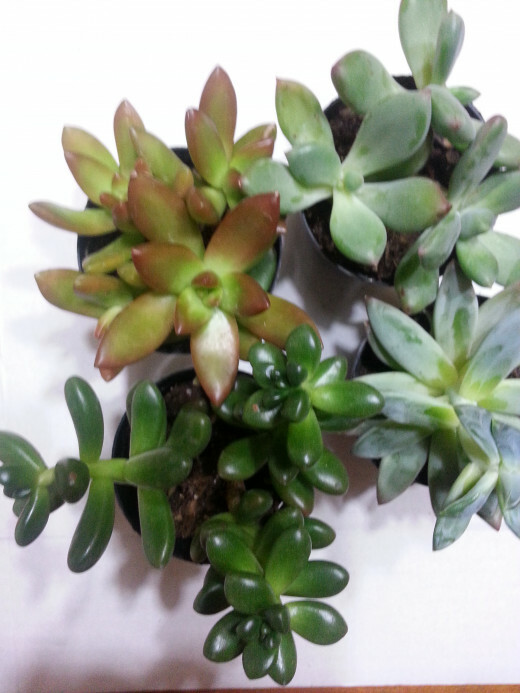 Succulents are grown as ornamental plants because of their striking and unusual appearance." A Conversation Piece and Then Some! Talk about a conversation piece, well, this striking and unusual living painting is just the ticket! I bet your neighbors do not have anything like it, and if they do, their living painting is unique to their own artistic eye. The great thing is that no two living paintings are ever just alike. They are all one of a kind masterpieces indeed! Did you know you too can create a striking and unusual living painting from an old picture frame and live succulents? Well, you can, and it is so easy to maintain. Once this masterpiece is created, it pretty much maintains itself. The hardest part about the whole project is building the planter box, although in reality, it is pretty basic too. You will be amazed at just how easy it is to add such beauty to your surroundings. It is easy to showcase a wall full of these beauties with little effort. You are unique, so why should you not create art that is anything but out of this world, full of life, color and textures? When you can frame something exquisite and alive, which is also healthy for your home environment, why not do so? It is time to think out of the box or, in this case, in reality, in a planter box! 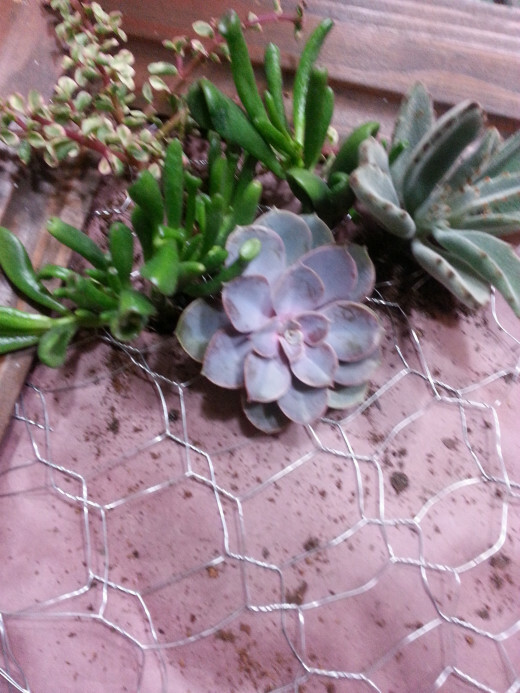 Chicken Wire, a lightweight, galvanized 2 inch hexagonal pattern works great for this planter. If you already have succulents growing in your garden, break the small “pups” (the stems should be at least 1/4 inch long). Set the cuttings aside in a cool area for a few days to allow their stem ends to dry and callus over. 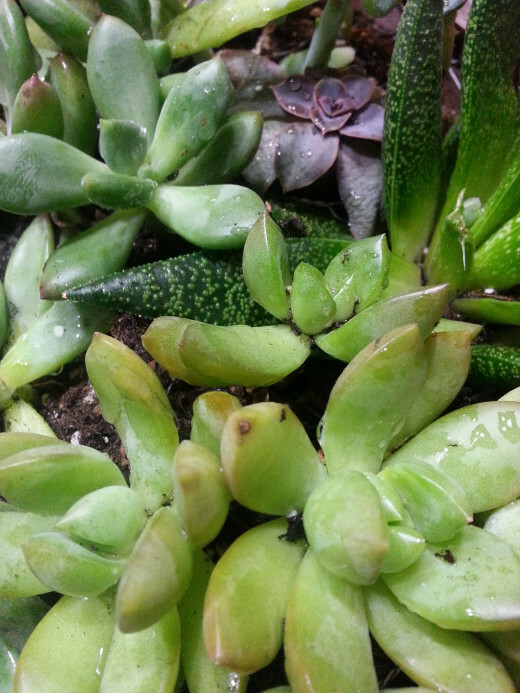 Note: Well-drained soil is crucial for succulents. Roots that sit in constantly damp and wet soil, will end up rotting the plant. For a 1-foot by 16 inch planter box, cut two 2-inch widths of 2" x12" lumber. Then cut two more 2" by 16" lumber (be sure to use pretreated wood, especially if you are hanging your painting outdoors). 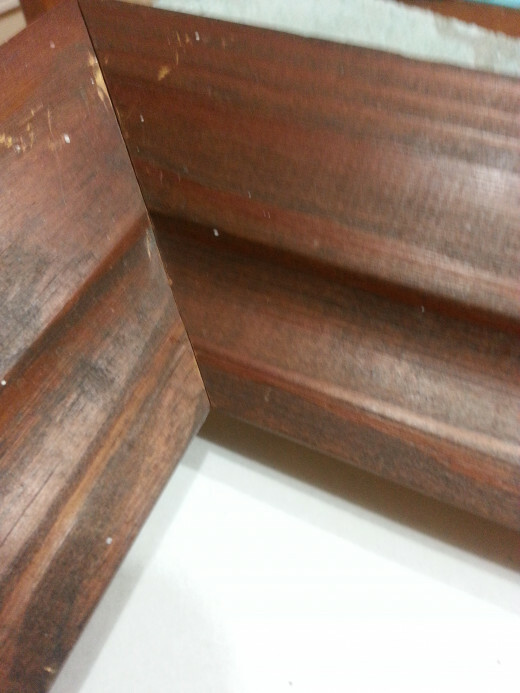 Nail the corners together for a frame 2 inches deep. Staple the wire mesh to one side of the open frame. If desired, add trim on top of the mesh to hide it. I have done this using an old picture frame. One can use old barn wood or driftwood to frame the outside too. Staple or nail a 1-foot by 16 inch piece of treated plywood onto the open back of the frame (drill small random holes in the bottom piece before nailing to allow for plenty of drainage). 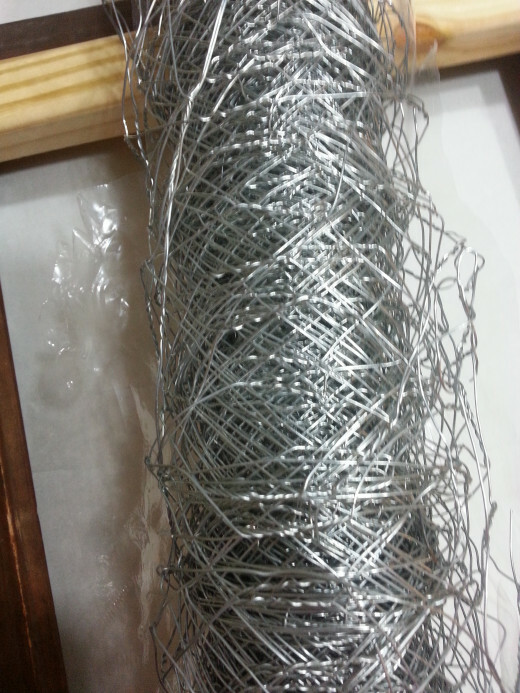 Cut the wire netting, and trim each side approximately 1 inch less than the outer picture frame itself. 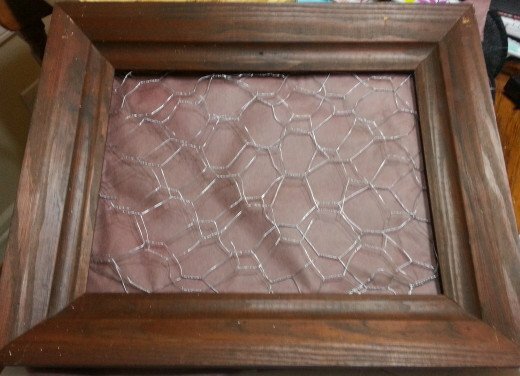 Using a staple gun, attach the wire netting to the back of the outer picture frame. 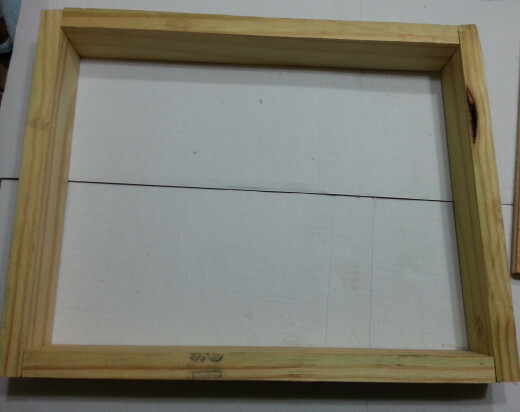 Attach the outer picture frame to the inner frame. 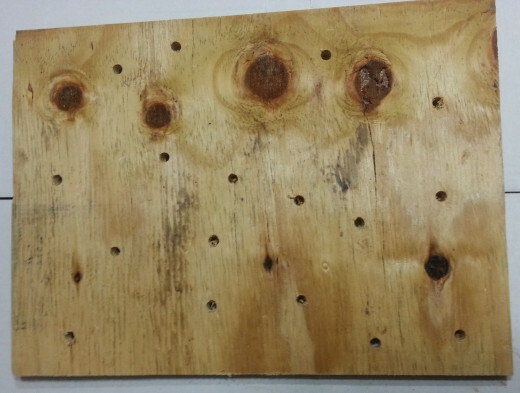 Drill pilot holes to prevent splitting the wood. Then nail through the outer picture frame, directly into the inner frame, using galvanized nails. Line the planter with organic landscape fabric. The fabric should lay right against the wire netting, and extend up a couple of inches on the inside of the planter. 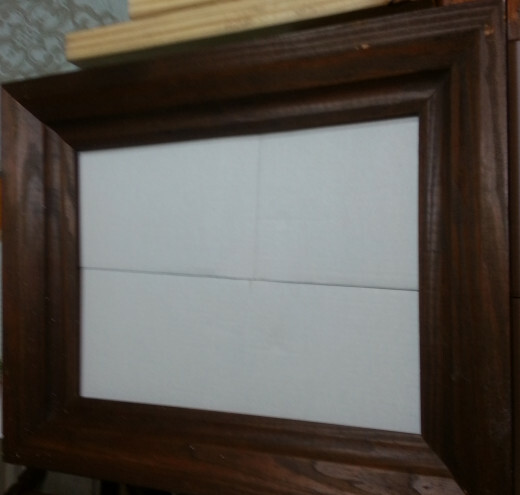 To hold the fabric in place, staple the sides of the fabric to the picture frame with a staple gun. Attach heavy-duty hangers (eye bolts) for hanging your painting. 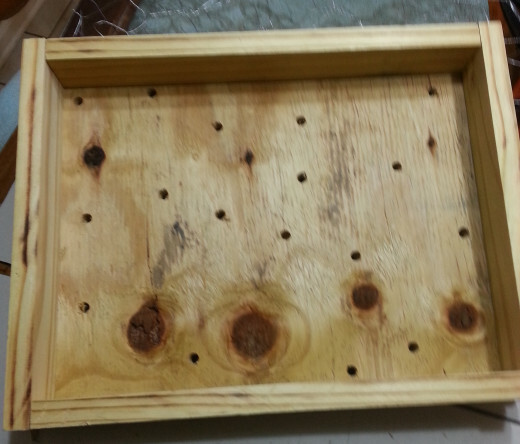 Attach the back of the treated plywood with the drainage holes to the planter. The back panel can be cut from a piece of pressure treated plywood, cedar paneling or waterproof plywood and attached to the planter with a nail gun (I did not have a nail gun, so I had to use a hammer). Treated Plywood 12" X 16"
Make sure the planter box is set on a flat strong surface. Fill it with moist cactus mix. Once the planter is filled with dirt and plants, it will be quite heavy, so choose hanging hardware accordingly (two heavy-duty eye bolts). Just keep in mind the weight of the planter once it is filled. 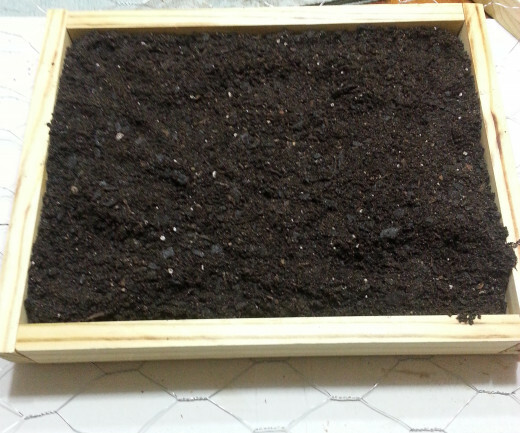 The wire mesh and wood backing help to hold the soil in place. If you were to purchase a succulent “painting”, they sell for $95 just for a 6 by 12 inch painting/planter! The one I made here is 12 X 16 inches. If you already have a succulent garden, then you are way ahead of the game in the cost of the succulents. Also, if you are artistic and love planting, you may be able to make a great living from creating living paintings using succulents, especially if you already grow your own succulents! Fill the wall planter with plants. Begin planting by snipping the wire netting to accommodate the roots of the plants. Then slice the landscaping fabric with a utility knife to expose the potting soil. The less wire that is cut, the better, as it does serve as support for the plants. 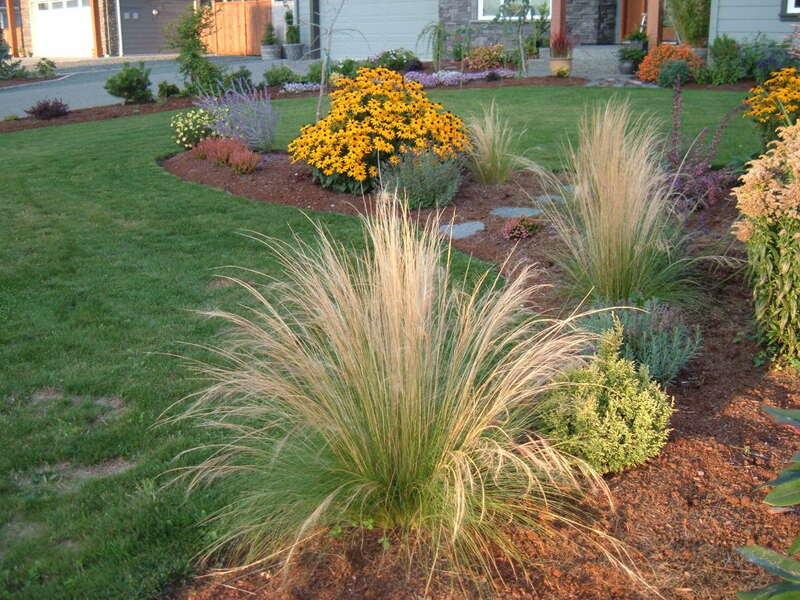 Just poke a shallow hole, set the plant just under the soil and firmly pat the dirt around the base of the plant. As you work your way around the planter, any wire that needs to be cut can be bent back into the dirt to help hold and support the plants. Leave the frame lying flat in a cool, bright location while plants take root, about 7 to 10 days after planting, and then begin watering. Once the planter is filled, use a soft paint brush to gently brush away any dirt that is on the plants. 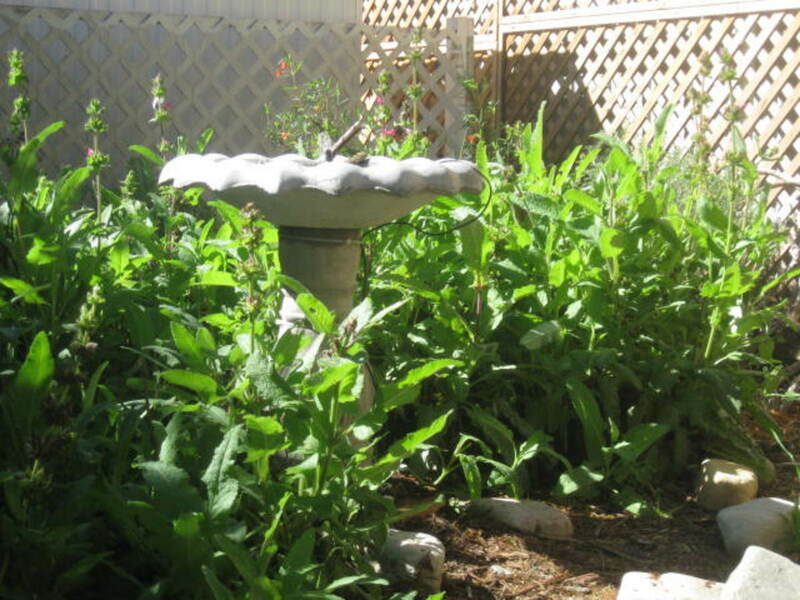 Spray the entire planter lightly with water. 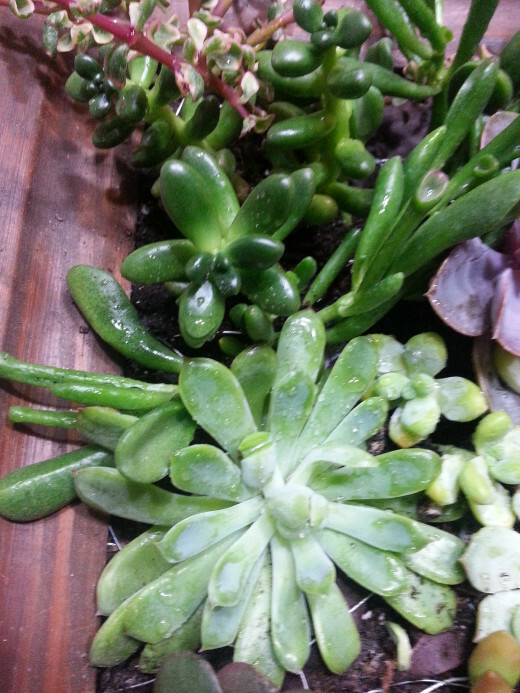 The water bottle actually helps to keep one from over-watering the potted succulents, which is quite easy to do. Prior to hanging, allow the planter to lay flat for 5 to 6 days. This will give the plants time to settle and establish roots, though some of the cuttings may require more time. The planter should be taken down and watered once a week or when the soil is completely dried out. Be sure not to over water. The plants should be watered at their base and the stream from the water bottle is perfect for this. The colors and textures are simply fabulous and once established, these intricate beauties will practically grow themselves. 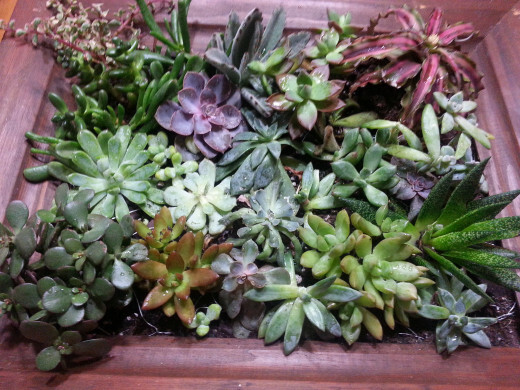 Do you think you would enjoy creating a succulent wall painting planter? Yes, I would love to give this a try! No, I do not have a green thumb at all. Possibly, as it seems easy enough. The Reserve Gardens of Schoenbrunn Castle (Vienna) -Where One Can Find the Oldest Recorded Caudiciform Succulent from Africa! Garden art quotes are never out of style, but so what if they were? It isn't just writers who would continue using them for they are perennially favored as garden décor. Design and enjoy your own! I love this and will be making one. Hi Audrey! Oh, wow, I bet it was amazing. That you for sharing that with me. Yes, you can make it as big or small as you want. What's great is that no two will ever be alike. The dirt does make it heavy so make sure to use heavyweight bolts to anchor it. Succulents have such unusual texture and thickness, plus so beautiful in shape and color. 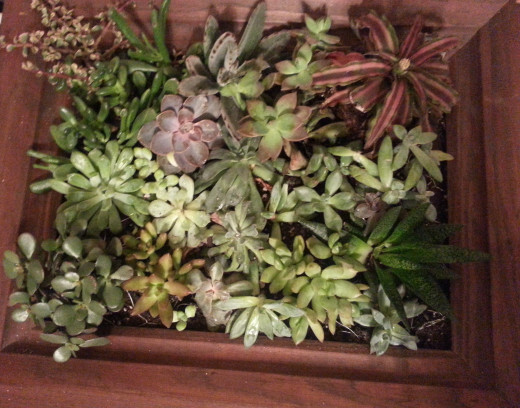 I happened to see my very first succulent garden (it was huge) on the wall of a new vegan restaurant 2 nights ago. I couldn't take my eyes off of it. And now I find your magnificent hub (on FB) with steps on how to make my own. I'm so excited. Thank you so much! Oh, you are so kind for revisiting here. Well, I will say revisiting too as I am too tired to scroll through my own comments LOL ...now that is pitiful isn't it! I am blessed that so many read and take the time to comment as you always do, dear one. So happy you stopped to say "hey" and thank you for letting me know you are thinking of me warmly this day. What a sweetheart you are to tell me such. Yes, all is well here, just extremely tired from an overload of work in the city, but that is really a blessing when so many are out of work. I appreciate you saying this is a lovely hub. Please do steal some of these ideas! That is the point : ). Hugs and much love to you and yours, sweet friend. Adore plants so of course this one drew me in. I think I commented on it before but am not scrolling through to double check because I am really stopping to say 'hey' and let you know you are thought of warmly today. Hoping all is good with you and yours and please know that Angels laden with blessings and hugs aplenty are on the way. So happy you like this idea here. Anyone can create it as it is truly a simple project that is a great conversation starter no doubt. I am glad the instructions are easy to follow. I think the succulents are doing all the work here as they are so delicately beautiful and are what makes this painting come to life and so unique. Thank you so much for the vote up and more and sharing. I have been having a bit of trouble with Pinterest too. They changed their format it seems. I thought I read this wonderful hub but don't see a comment. Not only is this an original idea but certainly one anyone would love to have. Your instructions are easy to follow and your pictures make us feel like we're right there with you. Voted up, useful, awesome, and interesting. Shared and tried to pin but had trouble with my iPad logging in. Yes, today is a beautiful sunny day here but still cold. I am looking forward to spring. I do hope you give this one a try. It can be a bit expensive if you have to purchase the succulents, but if you already hae a garden then that saves a lot. I appreciate the pin, share and vote up and G+ too. Thank you for the blessings and Angels as always. Hugs and many Angels heading your way too. It is trying to be spring here so I am looking for lovely ideas to use at my home. The other day I was just looking at succulents which I adore. I may have commented on this before but love it so much I had to come back. Thank you so much. One cannot really go wrong for the plants do all the work with their beauty. Oh, this does not take up any space at all, and you can make it any size you want. Wherever you usually place a painting, this will work there as well! It is really an easy project that makes a wonderful conversation piece like no other. I appreciate you stopping by my side of HP Town. Hope you are enjoying a wonderful Saturday so far. So happy to see you here this day! I have missed you terribly. However, I, too, have been remiss in publishing, but have continued to enjoy reading all those I follow writings. I plan on remedying that very soon though. I hope and pray you are doing well. Thank you for blessing me this day with your presence here. I love you too, dear sister. God bless you and keep you always. Yes, many people have their succulents growing in outside gardens, just as Jackie Lynnley does, who commented above. Of course, during the winter, they will need to be protected. I love placing my wall hanging on a wall on my patio where it is somewhat protected from the elements, but it does fine. However, in the winter, I do bring mine inside and hang in a bathroom. They seem to like the steam, as they do not require much water at all, which is convenient. However, you must use heavy-duty hanging hardware, as the painting is very heavy due to the dirt. I hope you give it a try. Succulents are so very unique and beautiful with such delicate shapes and gorgeous colors. 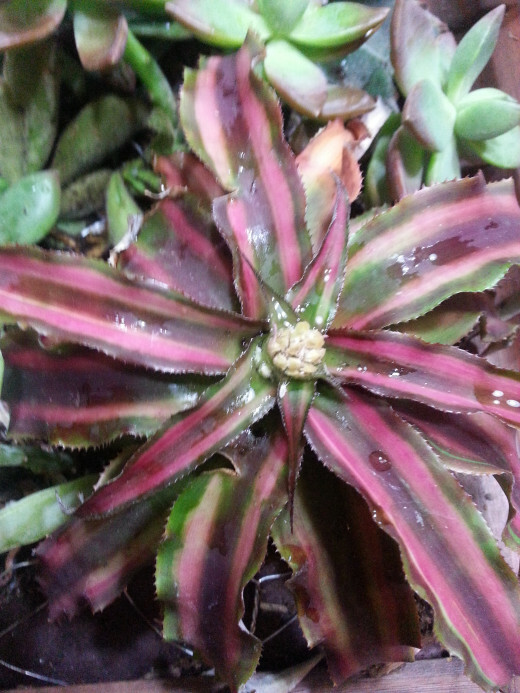 I do hope your outdoor succulents survive this frigid winter wee having, well, we are down here in the Deep South. Stay warm and hope you love your new do! Wow this looks amazing! If I had somewhere to put it I would make one. I love your succulents. unique project but can these plants live long indoors? I have mine where they will get cold which I don't think hurts them unless they are wet and frozen; hens and chickens mostly with a couple others I picked up at a greenhouse. they look good right now and I will throw some leaves over them! Out of site out of mind til spring. Going back to the beauty shop in a little while. Hope I get what I went for this time! The living painting can hang outside on a patio wall during the warm months and then bring it in during those really cold winter days. Yes, now your kitties may get into them, but you could place them in a room and keep the door shut. George, our cat has not bothered them yet, but he sure is wanting to get up in the Christmas tree this night lol. I haven't any luck keeping those inside (they want to over grow it seems) and besides someone would make a mess of them I know! I let my kitties stay in later tonight and you would not believe the mess; it is like a couple of children playing only my kitties run faster! Actually I would have never allowed my kids to act that way...lol. Thank you for returning to this hub. Oh, I am glad you have them sheltered. At least with the live painting, so-to-speak, I can bring it inside during the winter months. I do hope yours come back in the spring too. Oh, my! Please forgive me for not seeing your comment here from six months ago! I apologize and do not know how that happened, but glad Jackie just commented here this day, and I saw your comment. 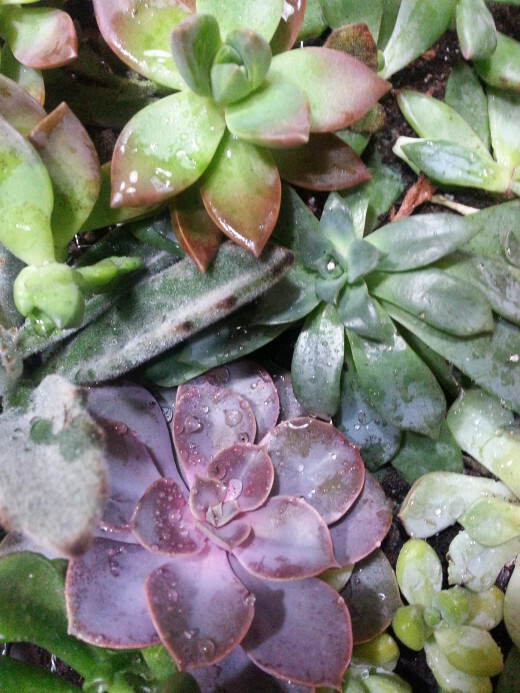 Thank you for sharing about your succulents in your garden. So true, their texture is certainly amazing and colors as well. I hope you can try this project out using some of your succulents, but if they are already growing nicely in your lovely garden, that may be the best spot for them. I had forgotten about this hub but got me some of these started in a couple places this summer; I put them up against a building to be mostly sheltered this winter. Hope they come back pretty in the spring! I just started some succulents in my garden last year and I am thrilled. The texture is amazing and the colors are stunning. Wonderful idea and instructions! I appreciate your most generous comments here. Well, these beauties, the succulents, God made so beautiful, they stand on their own. All I did was poke them through some chicken wire into the soil in the 2" deep planter box I made, drilled holes and nailed the frame on the front LOL. Oh, I am thrilled you are going to make a couple of my projects. You are so creative, and that is what is great about these projects is that they are unique as the person creating them. The tea and cake was amazing : ) and I always enjoy your visits. I am blessed to know you and I appreciate you and thank you for voting and sharing. Well well dearest sister. You are a very talented and gifted woman. This is stunning. I love it. I really do love this project. I have never seen anything even close to this. Brilliant. Thank you so much for the "wow" and I am glad you found this beautiful. Truthfully, the plants do all the work of just being beautiful by themselves, and all one has to do his add the planter box and soil on the back of the frame and chicken wire and you have a beautiful living painting! I cannot stress this enough, being it is so heavy with the soil, one must use heavy-duty hanging material to ensure it stays on the wall, and then when you get ready to water take it off the wall and allow it to drain well. Succulents need little water or their roots will rot, so using the spray water bottle is best to get to the roots and not over-saturate them. I hope you give this a try and it works well for you and you are able to enjoy it for years! I appreciate the vote up and more. Wow, what a beautiful craft to make. It is a very interesting piece of art and gardening that combines both botany and artistry in a very lifelike way. I have never seen something like this before, a "live" painting really would add some life to any home. I love this idea! This is a truly beautiful hub, Faith and I have enjoyed reading it so much. The pictures are beautiful too, voted up +++ and voted beautiful and interesting. Thank you so much for reading! Yes, the succulents are very special indeed and make this project such a unique piece. very beautiful! what a great way to show off these special plants. Thank you for stopping by here to read! Yes, I had no part in the creation of these beauties, the succulents, and they really do have such subtle coloring and shapes, which makes this project oh so simple, as the beauty is already there. In addition, they are really easy to maintain. I am glad you enjoyed this tutorial and I do hope you give it a try. Let me know how it turns out for you, if you do decide to give it a try. It is an interesting and very unique piece to add to one's home or outside living area for sure. I appreciate the vote interesting. A wonderful selection of succulents in a variety of colours - what is there not to love? I enjoyed looking at this tutorial and look forward to having a go myself sometime! Voted interesting. I am so glad you enjoyed reading this hub and thought it a beautiful and clever project and loved all the photos too! You should give it a try, as it is truly not hard at all. So glad to see you visiting my hubs this day! I appreciate you reading. What a beautiful and clever project, Faith! I really enjoyed reading this Hub and I love all the great photos you took. Thank you so much for stopping by to read! I am glad you love this project. I will take the "awesome" and hope you will give it a try, as it is truly fun and makes a unique piece like no other. awesome! I love it. Voted up, sharing!! This is an awesome hub. I have succulents and aloe veras in my garden but I have just planted them in a normal way. Yours is so beautifully crafted. That would be nice if I could do that sometime. Thanks for sharing this idea of planting. Voted up and shared. I am glad you thought this project beautiful. I appreciate you reading. Thank you so much for reading and leaving such kind comments. Oh, I do hope your hubby is feeling much better soon! Oh, yes, please give this a try, as it is truly very easy and so beautiful, just for the mere fact of the beauty of the succulents, nothing that I added to make them so! I appreciate the vote up, share and pin! Faith, that is really beautiful! Thanks for sharing such a great idea for displaying such pretty plants. Oh. Wow Faith, this really is exquisite. I can't wait till hubby is feeling better so I can show this to him, both of us really enjoy, creative workmanship. I may try this, one day. Saved to favorites so I will not forget. Thank you so much Writer Fox for reading and leaving wonderful comments. I appreciate the vote up and pin. This is a fabulous idea for making a homemade gift that anyone would enjoy. I look forward to reading more of your creative articles. Voted up and Pinned. So wonderful to see you here reading. Wow, that is wonderful you already have a garden with succulents! You are ahead of the game when it comes to giving this project a try then for sure. Oh, it is not hard at all, and as you know, the succulents pretty much maintain themselves. I do hope you give it a try to make your own masterpiece to hang whether indoors or out on the patio or wherever. This is such a wonderful idea. I have a lot of succulents in my garden. It would be fun to bring some of their beauty indoors. Your instructions are very clear and easy to follow. So, it looks like something I can do. Thanks for showing me how to do this. So great to see you back here at HP writing and reading! I am grateful for your enthusiastic comments. Oh, one does not have to have a green thumb with these intricate beautifies, for they pretty much care for themselves. Just water the roots once a week with a spray water bottle and you are good to go! Truly, really easy and beautiful project with very little maintenance. So, I believe you could easily do this project with little effort and maintenance. Thank you so much for reading and the vote up! I appreciate your kind comments. Yes, this is indeed unique way to plant succulents ... to frame them in a frame as a living painting. Wow! Very creative and impressive! I do not have a green thumb at all, so I won't harm these poor plants but will pass this on to anyone who does!! What a unique and creative way! 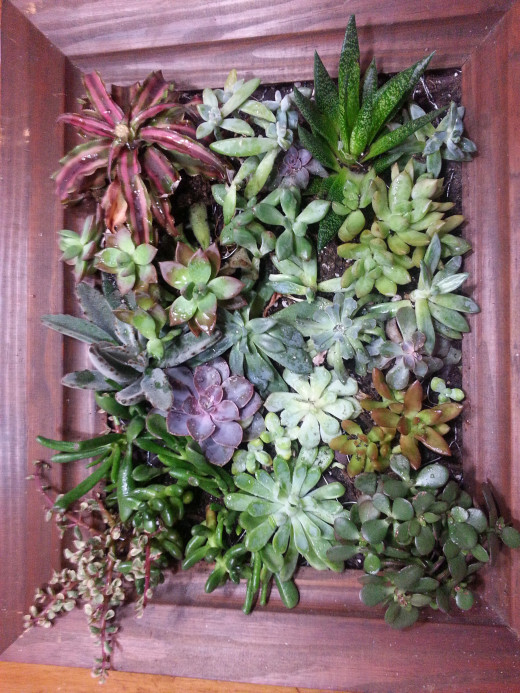 This is a great idea to plant succulents in a frame. Great step by step instructions. Voted up. Wow, suzzette, thank you so much for the awesome comments! I really did not know they were called succulents either, but did know of them and their intricate beauty. I love them for their uniqueness in coloring and shapes. I am thrilled to learn not many have seen this done before! I am glad you will give one a try as it really is simple and the plants themselves are what makes all the difference in the living painting. Each "painting" is unique to its artist. One can even create the outside frame out of whatever one has on hand from an old frame to pieces of driftwood or even barnwood ...just whatever one has on hand will do! Thank you so much for the vote up and share. Wow, suzzette, thank you so much for the awesome comments! I really did not know they were called succulents eithet but did know of them and their intricate beauty. I love them for their uniqueness in coloring and shapes. I am thrilled to learn not many have seen this done before! I am glad you will give one a try as it really is simple and the plants themselves are what makes all the difference in the living painting. Each one is unique to its artist. One can even create the outside frame whatever one has on hand from an old frame to pieces of driftwood or even driftwood ...just whatever one has on hand will do! Thank you so much for the vote up and share. Faith: I am nearly speechless! This is the most original and creative hub I have ever read on HP! These succulent framed plantings are beautiful and gorgeous and do make a lovely living wall hanging. I would have never thought up something like this. I didn't know what a succulent was until reading your definition here. Thank you so much for sharing this with us. Your directions are easy to follow with all the wonderful step by step photos. I love this idea and will definitely try this out! Voted up and shared! Thank you much dear girishpuri. So glad to see you here reading. I appreciate the generous comments. What a brilliant, creative and awesome hub, God bless you, faith. What an awesome and creative idea. I also love the way you provide detailed instructions for I need them. I can't wait to give this idea a try. I love the idea of having one of these hanging on the wall on my front porch. My plan is to create one for the porch that I will bring in when it gets too cold. Oh, yes, that would be a great place to place it for sure! If you try it, let me know how it works out for you. Thank you Faith. Yes it would look awesome on my balcony wall. Thank you for reading and I am glad you like how this looks. Using the succulents, one cannot go wrong, as they are such intricate little beauties and this is a good conversation piece, as one does not see such too often, if ever! Have a great weekend on Boomer Lake. I like the looks of this, and what a conversation piece! Thank you so much for reading and leaving such generous comments! Yes, the succulents really do have the most amazing subtle colors indeed. I wish I had more of the light purple (lavender) colored one with the beautiful shape, but I only had the one. It stands out to me and is my favorite one, although I love them all. So glad you love this creative project. I appreciate the "wow" too. So great to see you stopping by to read! Oh, yes, the succulents are such intricate beauties, and that is why this project is so very beautiful, as one is way ahead in the beautiful department just by using these plants. They are very intricate and unique and all one needs to do is build the planter box and then poke the plants into the holes and then frame the outside of the planter box ... and your masterpiece is done! I do not think any other type of plants will work for this project to hang on the wall, as the roots have to be able to survive in only two inches of soil. 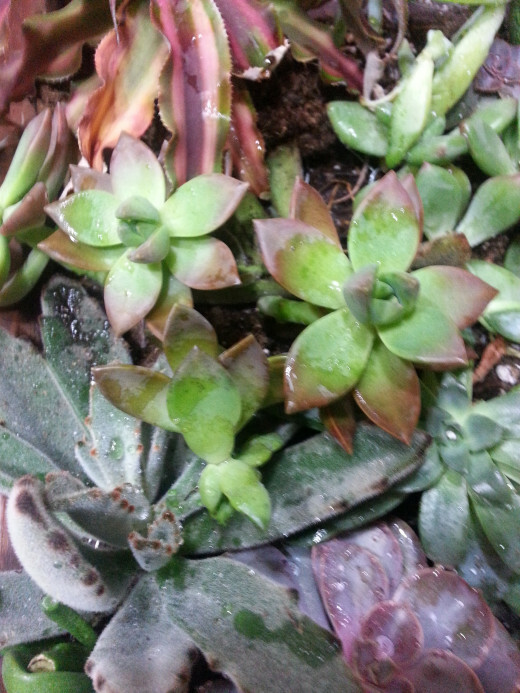 That is why these plants, the succulents, are necessary for this project. I am glad you think this is a cool project. You should give it a try, and it does not matter if it is winter, as it can be hung inside too. I have been blessed twice this day by your visits! 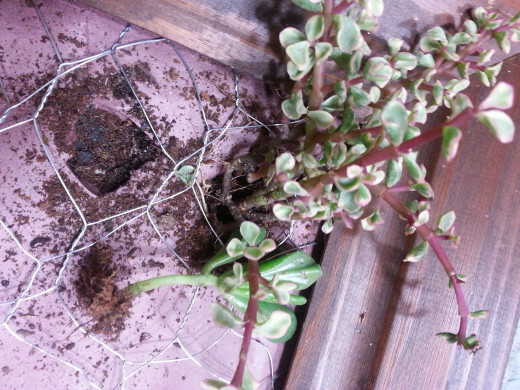 Between the chicken wire and the garden fabric, the dirt is held in, coupled with the roots of the succulents. You have to allow this to lay flat for about seven days or maybe a little longer for the roots to take really well. Then you can hang it on the wall. To water it, you take it off the wall and lay if flat again so it can drain and you only water the roots with the spray water bottle, as overwatering will cause the roots to rot. I hope you give this a try, and it can be hung inside or out! Awesome!!! So nice to meet you and I am thrilled you already have the succulents, so you are ahead of the game. Enjoy creating your own masterpiece, like no other! I appreciate you reading this day. So lovely to see you here this day reading! I have missed seeing you around these parts. I hope all is well with you and yours. I am so glad you found this to be creative. Oh, if you have a Home Depot, Lowe's or even Walmart in your area, they actually carry succulents in their garden area inside. 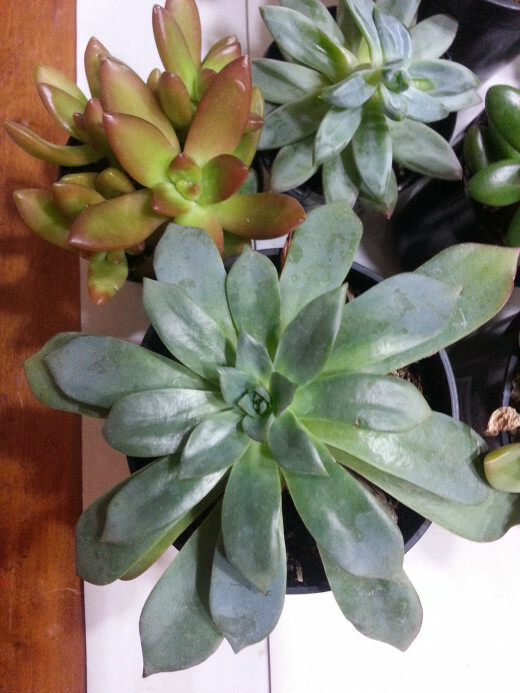 If one does not have a succulent garden, then I have found the best place to find succulents is Home Depot. Only certain Walmarts will sometimes carry them too. If you do find some in your area, it matters not if it is too cold outside, as this living painting can actually be used indoors as well! So, you are good to go. I hope you try this if you happen upon some succulents in your area. I appreciate the vote up, pin, share and especially the love from the sky!!! This is an amazing project and beautiful art form. I love it. 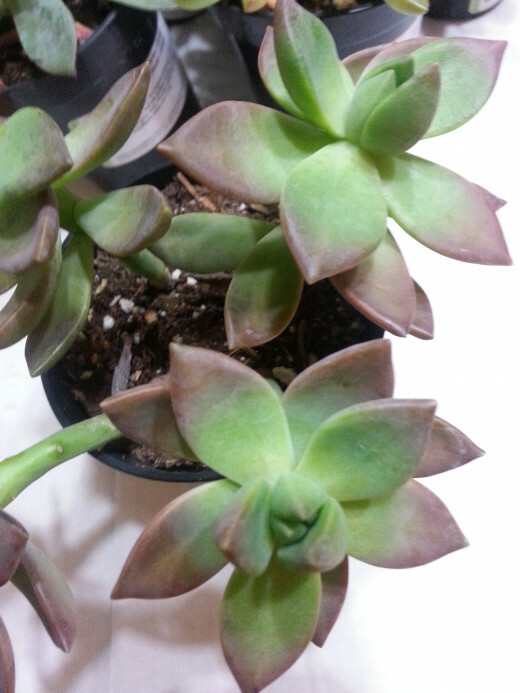 Succulents are fun to grow and have such lovely, subtle colors. Your finished product is gorgeous and your hub is well-written with easy to follow directions. Thank you for sharing this. Wow! What a wonderful idea! Love this!! What a cool idea! Very attractive and I love the choice of plants. Thanks for sharing! I love this and you impressed me Faith. The only question I have is does the dirt fall out of the holes or how do you water it? 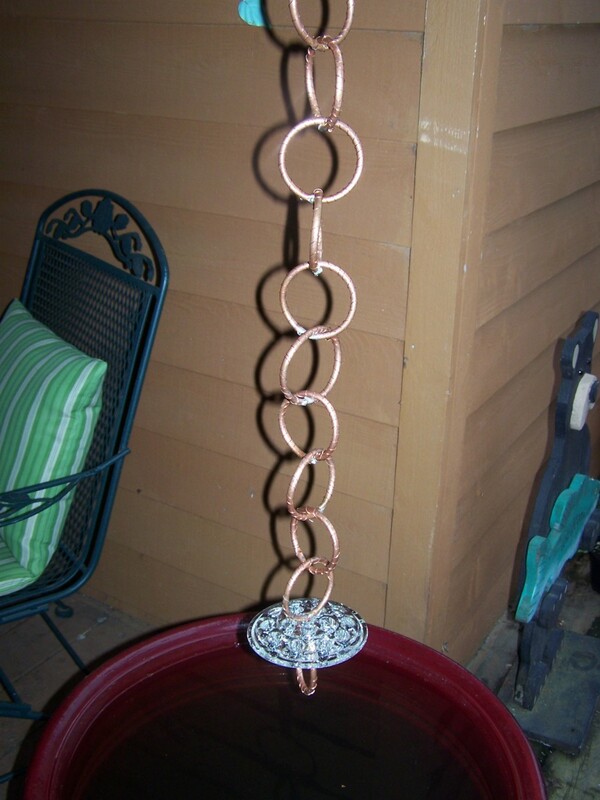 Great DIY project! I am definitely going to try this, I already have the plants. Wow, this is so very creative! I'd love to try it but not sure if I'll find these beauties (succulent plants) here up north. 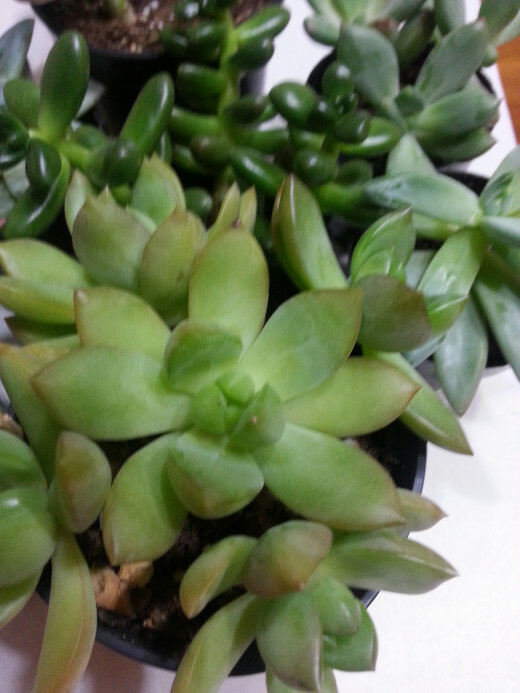 I doubt if they'll survive the extremely cold weather. Awesome hub Faith. Love the detailing. Up, Pinning and sharing. Meanwhile, here's some love to you from the sky. Always a blessing when you are able to stop by to read. Oh, yes, you're right, the entire family can participate and enjoy planting the succulents. 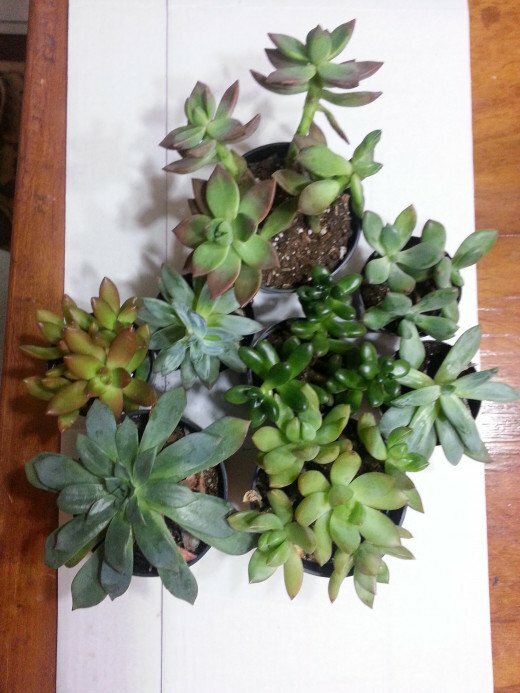 They are very delicate, so one must take care when handling them, but it is so much fun gathering and arranging the succulents to form a painting and then frame it and hang it! I've never heard of this before, what a great idea! Just like usually, very informative and great visual aids dear faith. This is a great project for the family, get that family-fun in! Hope all is well dear Faith. Always a joy to drop by. Take care and Bless You Always!!! Yes, we have had a dreary cold winter here in the deep south too, with snow and ice even. Last weekend was lovely though, so that was a nice break! I would love to hear back when you have a chance to give this project a try. Yes, it will certainly add a lot of life to this dreary winter! I'll certainly report back to you if I try this lovely artistic venture. We're experiencing grey, cold, wet weather here (for weeks now) and the Somerset Levels a few miles away have been flooded since Christmas; we could all do with a lovely living picture like this to keep our spirits up! Wow, thank you so much for the "brilliant" and I will take that for sure! Yes, the succulents are such intricate beauties that one cannot improve on one bit, but one can gather them together and create a living masterpiece so-to-speak. Oh, I do hope you give this simple project a try, for the plants maintain themselves and you have an exquisite, one of a kind painting, a living one. This is probably something one does not usually see and so you would have something unique like no other. Oh, the chicken wire helps to hold the plants in, so if you have to cut some of it while planting, be sure to fold it back into the soil to help hold the plants in. This project is in the laying flat stage right now, as it takes about seven days or so for the roots of the plants to take hold, and then it will be safe to hang vertically. Also, the garden fabric helps too. I found the organic garden fabric at Lowe's. So glad this hub has inspired you and that you found it refreshing to read something entirely different! Have a lovely day, and let me know how it turns out for you, if you do decide to give it a try. What a brilliant hub, Faith! These are beautiful plants and the photos are stunning. Sadly my wall space is at a minimum as I have many family photos; however, I'll try this one day as I have a few succulents already and they're so decorative. You've inspired and given clear, practical advice at the same time. I was wondering how you'd keep the soil in at the vertical! Didn't know that fabric existed. I'll have to look around here for it. Thank you so much for the wonderful comments. Oh, well, it is actually really easy to create, as God already provided the exquisite beauty in the succulents, and all one has to do is poke them through to the soil and they are so very easy to maintain. The making of the planter box may be the hardest part of the whole project or either making sure you have the heavy-duty eye bolts to hang the painting, for it is very heavy and pray it does not fall off of the wall! However, really making the planter box is not really hard. This is a very creative craft-floral idea for a patio area. You make it look so simple. Thanks for the idea. Thank you so much for the great comment and I am so glad you found this to be incredibly creative. I appreciate you reading! Yes, the succulents are perfect to hang being they only require 2 inches of soil to plant and grow. It is certainly different and not at all hard to do. The planter box is the most difficult, and it is really not difficult at all. This is such a clever idea. I never would have thought of having growing plants hanging like that. Always so lovely to see you stopping by to read! I am so glad you love this, and, yes, I cannot create such beauty all on my own of course, for God made it easy when He created these exquisite succulent plants and all I had to do was plant them and frame them! Oh, I do hope you do try this, as it is so beautiful and not hard all at and the plants pretty much maintain themselves. It is a unique piece for sure. Oh, Faith, I loved this! The instant I saw the photo, I wondered, “How did she do this?” I’ve never seen anything like it before. When I read through the directions and viewed the photos, I immediately knew I wanted to try this. Thank you! So great to see you stopping by to read! I am so glad you loved this hub and I appreciate the vote up. A great hub Faith; loved it and voted up plus saving. I appreciate your generous comments here. Oh, no, I cannot believe you did them in ... those your neighbor gave you, as they hardly need any attention at all, but I am glad you are willing to give this a try! Just take it down once a week and spray the roots and they should be good to go. You are so kind and thank you so much for the vote up and more and sharing. You're the best! I hope you have a great weekend dear friend. Hi Faith, how on earth did I miss this beauty!! This is right up my street. My neighbor gave me some succulents awhile back, some I managed to kill off, but I still have a few left, the living art is a brilliant idea, I'd love to give it a try. You my friend, are very artistic. Excellent hub, great images and very well done. Have a wonderful weekend and my best as always. Up all the way and sharing.